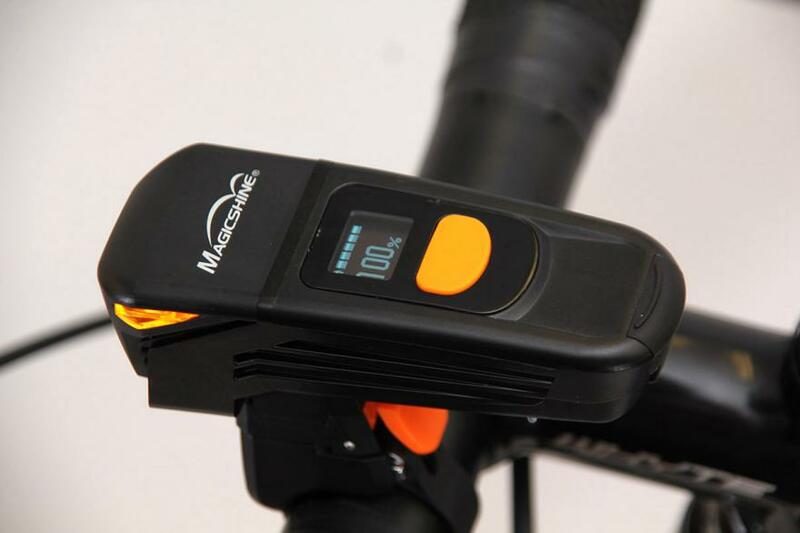 Home » Reviews » Magicshine Eagle 600 Bike Light: Why Should You Choose It? In the last few years I used several bike lights and mostly why I changed them to get better performance. Because I like the road biking than mountain biking and sometimes I plan for the night time ride in the streets with my friends. 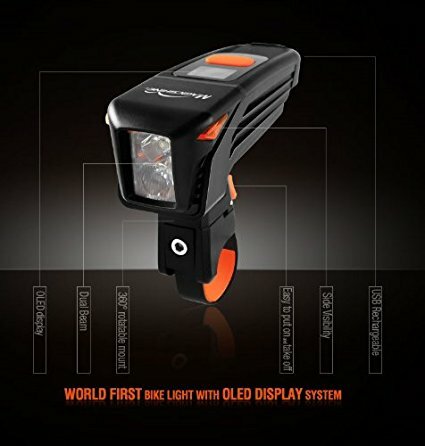 So I always wish to have a powerful bike light to illuminate the front road properly, because I don’t want to fall in an accident for blindly riding. Moreover, I want to ride confidently and at the same time I also want to make sure nothing is going wrong. So after a research I have discovered an amazing road specific bike light that is created with some useful technologies. And that is Magicshine Eagle 600 LED Bike Light. But this Magicshine Eagle 600 bike light is more than an LED light. It comes with two powerful LED and each of them come with 300 lumens while you can also separately manage the first one. The most noticeable feature includes the light its OLED display system that provides the amazing accuracy for battery life. So in below I have written some specifications that are really useful. This is an amazing feature that I first see in a bike light. Literally, it works very effectively than the indicators while the remaining time that the light shows approximately accurate. Actually, I am very comfortable with this feature than the indicators. It simply shows the percentage when the battery is full and at the time when I keep the light on, it simply shows the time regarding the battery life. After noticing the accuracy of battery life with real time display I can confidently go for a long ride without having any darkness. To illuminate the front path with a longer and crystal clear beam it features Cree XML LED that also can be operated with 9 lighting modes including 600, 100 lumens and flashing. It includes two LEDs that you can operate separately and they have different performance. The top LED focuses the front path with a sturdy beam length. On the other hand the lower LED creates a wider swath with diffusing lens. You can also anytime turn off the top lens, especially when it comes to save the pedestrians from feeling blind. 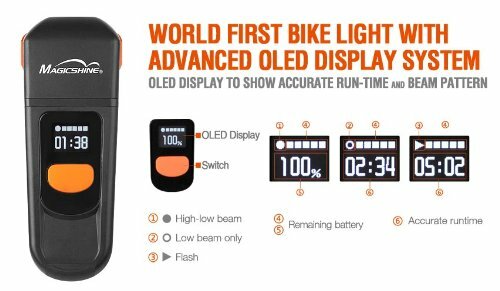 It features a single lithium-ion 18650 cell battery that can run the both LEDs for 1.5 hours with full beams and when the battery life ends, the light will not be off immediately. Rather the light will be dimmed slightly and taken a long time to be completely off. As the result you will be able to be still active on the ride without getting the darkened front path. The nine lighting modes also provide extra opportunities to precisely use the beams that can save a lot of battery life. To mount the light with different size handlebars it features an easy mounting bracket. You need an Allen Key to tighten up the screw after placing the rubber coated metal strap. It also features 360 rotation system to properly keep the light on at any angle. The light also can be removed simply from the mounting bracket by an easy button, so when you need to charge up, just use a little effort to remove the light. Powerful Cree XML LED lights provide a very crystal clear brightness. Side light increases extra visibility. OLED display perfectly shows the lifetime of battery and accurately calculates the remaining time. 9 different modes with a specific flash mode. Nothing has been found as weakness. Honestly, this is what I have looked for my road bike. I like the excellent beam strength and its OLED display. Like other conventional bike lights the Magicshine Eagle 600 also can be easily charged by USB cable while it is easy to operate for the experienced and inexperienced people. I think this is one of the best road bike light that I have ever seen.